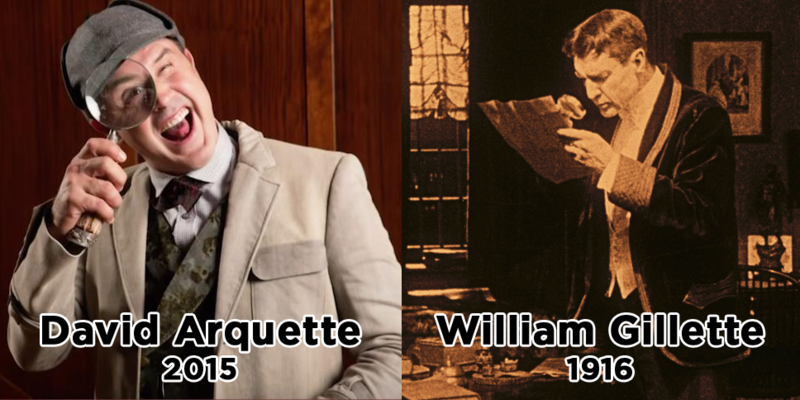 Home > Archives > Misc > Who Wore It Better: David Arquette or William Gillette? Tonight, David Arquette kicks off his tour as Sherlock Holmes in the play Sherlock Holmes: A New Theatrical Adventure. He’ll join the long tradition of stage and screen actors who have embodied the quick-witted detective – all beginning with the original Sherlock Holmes, William Gillette. Gillette played Holmes over 1,300 times on stage before reprising the role in the 1916 silent film Sherlock Holmes. His sartorial choices can still be felt today – from the curved pipe to the lush dressing gown. Which begs the question: Who wore it better? Bust out the magnifying glass, inspect the case, and let us what you decide @FlickerAlley. Then show us your interpretation of the great detective by entering the #FlickerOfSherlock Fan Photo Contest. Share a picture in your best Sherlock Holmes attire to Twitter, Instagram, or Flicker Alley’s Facebook timeline with the hashtags #FlickerOfSherlock and #FlickerAlley to enter for a chance to win William Gillette’s Sherlock Holmes on Blu-ray/DVD. Considered lost for nearly 100 years and newly-restored, it is the only filmed performance of Gillette as Holmes. William Gillette’s Sherlock Holmes premieres on Blu-ray/DVD November 3, 2015. Pre-order yours today for 25% OFF M.S.R.P.